In my last column, I wrote about how to use term frequency analysis in evaluating your content vs. the competition’s. Term frequency (TF) is only one part of the TF-IDF approach to information retrieval. The other part is inverse document frequency (IDF), which is what I plan to discuss today. Today’s post will use an explanation of how IDF works to show you the importance of creating content that has true uniqueness. There are reputation and visibility reasons for doing this, and it’s great for users, but there are also SEO benefits. If you wonder why I am focusing on TF-IDF, consider these words from a Google article from August 2014: “This is the idea of the famous TF-IDF, long used to index web pages.” While the way that Google may apply these concepts is far more than the simple TF-IDF models I am discussing, we can still learn a lot from understanding the basics of how they work. What is inverse document frequency? In this example, we see that the word “a” appears in every document in the document set. What this tells us is that it provides no value in telling the documents apart. It’s in everything. Now look at the word “mobilegeddon.” It appears in 1,000 of the documents, or one thousandth of one percent of them. Clearly, this phrase provides a great deal more differentiation for the documents that contain them. 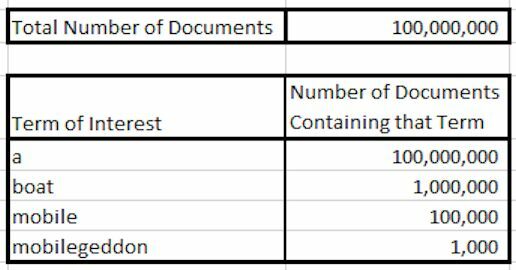 For each term we are looking at, we take the total number of documents in the document set and divide it by the number of documents containing our term. This gives us more of a measure of rareness. However, we don’t want the resulting calculation to say that the word “mobilegeddon” is 1,000 times more important in distinguishing a document than the word “boat,” as that is too big of a scaling factor. This is the reason we take the Log Base 10 of the result, to dampen that calculation. 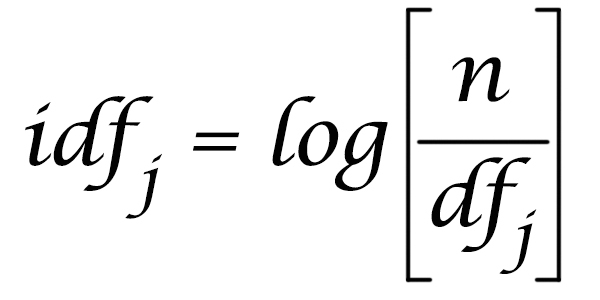 For those of you who are not mathematicians, you can loosely think of the Log Base 10 of a number as being a count of the number of zeros – i.e., the Log Base 10 of 1,000,000 is 6, and the log base 10 of 1,000 is 3. So instead of saying that the word “mobilegeddon” is 1,000 times more important, this type of calculation suggests it’s three times more important, which is more in line with what makes sense from a search engine perspective. Now you can see that we are providing the highest score to the term that is the rarest. What does the concept of IDF teach us? Think about IDF as a measure of uniqueness. It helps search engines identify what it is that makes a given document special. This needs to be much more sophisticated than how often you use a given search term (e.g. 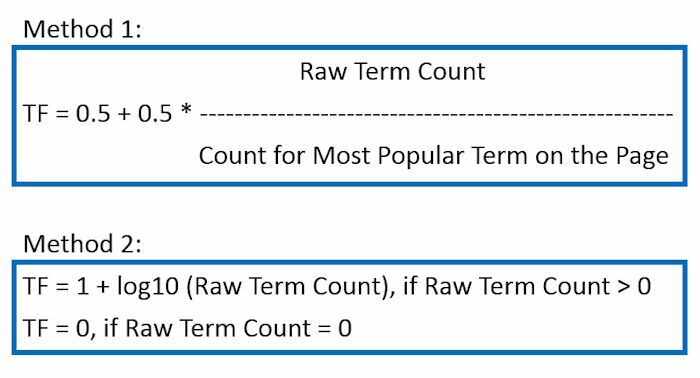 keyword density). Think of it this way: If you are one of 6.78 million web sites that comes up for the search query “super bowl 2015,” you are dealing with a crowded playing field. Your chances of ranking for this term based on the quality of your content are pretty much zero. Overall link authority and other signals will be the only way you can rank for a term that competitive. If you are a new site on the landscape, well, perhaps you should chase something else. That leaves us with the question of what you should target. How about something unique? Even the addition of a simple word like “predictions”—changing our phrase to “super bowl 2015 predictions”—reduces this playing field to 17,800 results. Clearly, this is dramatically less competitive already. 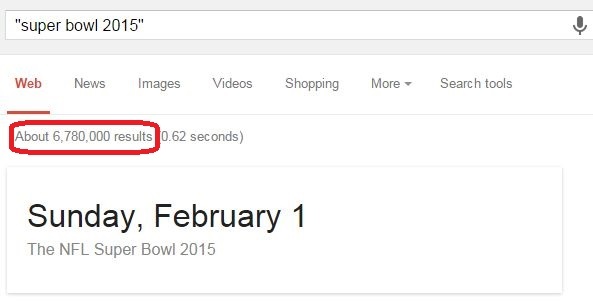 Slicing into this further, the phrase “super bowl 2015 predictions and odds” returns only 26 pages in Google. See where this is going? If you can pick out a smaller number of terms with much less competition and create content around those needs, you can start to rank for these terms and get money flowing into your business. This is because you are making your content more unique by using rarer combinations of terms (leveraging what IDF teaches us). People who do keyword analysis are often wired to pursue the major head terms directly, simply based on the available keyword search volume. The result from this approach can, in fact, be pretty dismal. Understanding how inverse document frequency works helps us understand the importance of standing out. Creating content that brings unique angles to the table is often a very potent way to get your SEO strategy kick-started. Of course, the reasons for creating content that is highly differentiated and unique go far beyond SEO. This is good for your users, and it’s good for your reputation, visibility, AND also your SEO. It’s time to look at your content differently—time to start understanding just how good it really is. I am not simply talking about titles, keyword usage, and meta descriptions. I am talking about the entire page experience. In today’s post, I am going to introduce the general concept of content quality analysis, why it should matter to you, and how to use term frequency (TF) analysis to gather ideas on how to improve your content. For purposes of today’s post, I am going to show you how you can use TF analysis to get clues as to what Google is valuing in the content of sites that currently outrank you. But first, let’s get oriented. Start by asking yourself if your page provides a quality experience to people who visit it. For example, if a search engine sends 100 people to your page, how many of them will be happy? Seventy percent? Thirty percent? Less? What if your competitor’s page gets a higher percentage of happy users than yours does? Does that feel like an “uh-oh”? Let’s think about this with a specific example in mind. What if you ran a golf club site, and 100 people come to your page after searching on a phrase like “golf clubs.” What are the kinds of things they may be looking for? 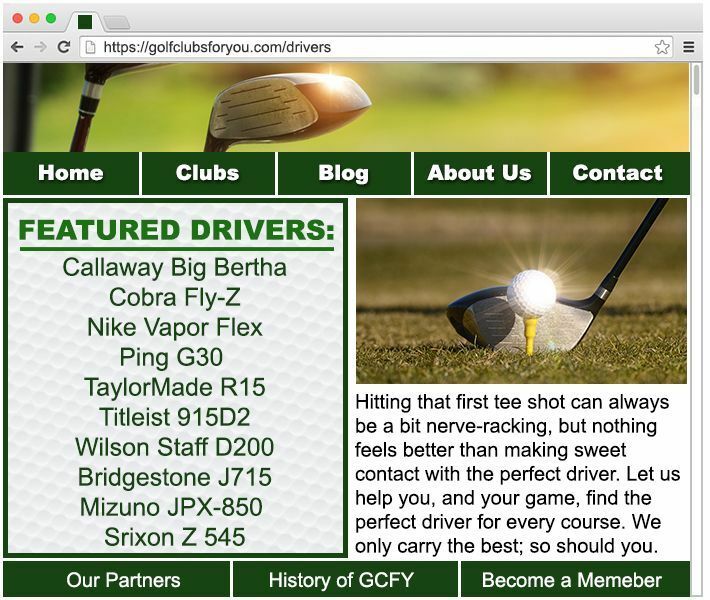 A way to buy golf clubs on your site (you would need to see a shopping cart of some sort). The ability to select specific brands, perhaps by links to other pages about those brands of golf clubs. Information on how to pick the club that is best for them. The ability to select specific types of clubs (drivers, putters, irons, etc.). Again, this may be via links to other pages. Expert analysis comparing different golf club brands. End user reviews of your company so they can determine if they want to do business with you. How your return policy works. How they can file a complaint. Information about your company. Perhaps an “about us” page. Whether or not you have been “in the news” recently. Trust symbols that show that you are a reputable organization. 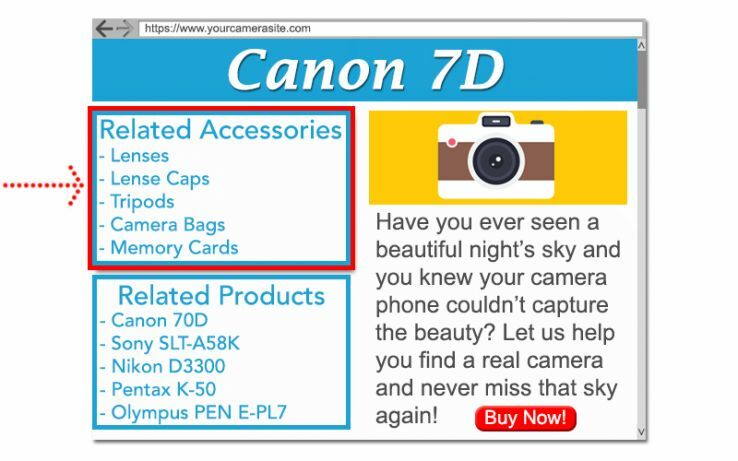 A way to access pages to buy different products, such as golf balls or tees. Information about specific golf courses. Tips on how to improve their golf game. This is really only a partial list, and the specifics of your site can certainly vary for any number of reasons from what I laid out above. So how do you figure out what it is that people really want? You could pull in data from a number of sources. For example, using data from your site search box can be invaluable. 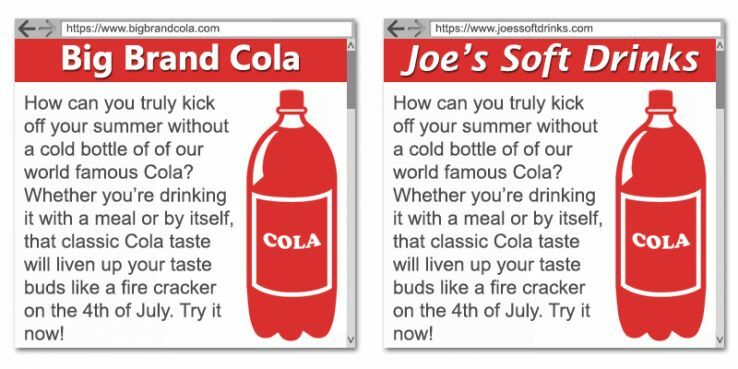 You can do user testing on your site. You can conduct surveys. These are all good sources of data. Whatever you do, it’s worth using many of these methods to determine what users want from the pages of your site and then using the resulting information to improve your overall site experience. Is Google using this type of info as a ranking factor? At some level, they clearly are. Clearly Google and Bing have evolved far beyond the initial TF-IDF concepts, but we can still use them to better understand our own content. Panda algorithm in February of 2011. More recently, we know that on April 21 Google will release an algorithm that makes the mobile friendliness of a web site a ranking factor. Pure and simple, this algo is about the user experience with a page. what we do know is their intent. They want to make their search engine look good, largely because it helps them make more money. Sending users to pages that make them happy will do that. Google has every incentive to improve the quality of their search results in as many ways as they can. Ultimately, we don’t actually know what Google is measuring and using. It may be that the only SEO impact of providing pages that satisfy a very high percentage of users is an indirect one. I.e., so many people like your site that it gets written about more, linked to more, has tons of social shares, gets great engagement, that Google sees other signals that it uses as ranking factors, and this is why your rankings improve. But, do I care if the impact is a direct one or an indirect one? Well, NO. TF-IDF analysis is more about relevance than content quality, but we can still use various precepts from it to help us understand our own content quality. One way to do this is to compare the results of a TF analysis of all the keywords on your page with those pages that currently outrank you in the search results. In this section, I am going to outline the basic concepts for how you can do this. In the next section I will show you a process that you can use with publicly available tools and a spreadsheet. The first method relies on dividing the number of repetitions of a keyword by the count for the most popular word on the entire page. Basically, what this does is eliminate the inherent advantage that longer documents might otherwise have over shorter ones. The second method dampens the total impact in a different way, by taking the log base 10 for the actual keyword count. Both of these achieve the effect of still valuing incremental uses of a keyword, but dampening it substantially. I prefer to use method 1, but you can use either method for our purposes here. Are there any highly related words that all or most of your competitors are using that you don’t use at all? Are there any such words that you use significantly less, on average, than your competitors? Also look for words that you use significantly more than competitors. None of these flags by themselves have meaning, so you now need to put all of this into context. In our example, the following words probably have no significance at all: “get”, “you”, “top”, “see”, “we”, “all”, “but”, and other words of this type. These are just very basic English language words. the spreadsheet. The issues above could well be significant, as the lead actors, reviews, and other indications that the page has in-depth content. We see that competing pages that rank have details of the story, so that’s an indication that this is what Google (and users) are looking for. The fact that the main key phrase, and the word “billing”, are used to a proportionally high degree also makes it seem a bit spammy. In fact, if you look at the information closely, you can see that the target page is quite thin in overall content. So much so, that it almost looks like a doorway page. In fact, it looks like it was put together by the movie studio itself, just not very well, as it presents little in the way of a home page experience that would cause it to rank for the name of the movie! A major lack of important synonyms that would indicate a real depth of available content. Comparatively low Domain Authority competitors ranking with in-depth content. These types of observations are interesting and valuable, but it’s important to stress that you shouldn’t be overly mechanical about this. The value in this type of analysis is that it gives you a technical way to compare the content on your page with that of your competitors. This type of analysis should be used in combination with other methods that you use for evaluating that same page. I’ll address this some more in the summary section of this below. How do you execute this for yourself? 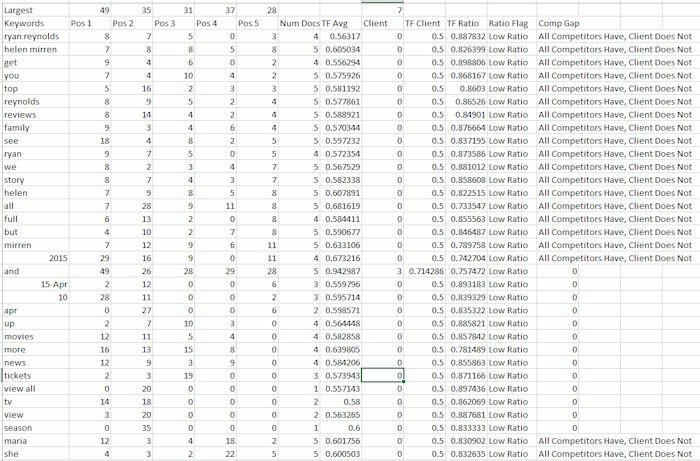 full spreadsheet contains all the formulas so all you need to do is link in the keyword count data. I have tried this with two different keyword density tools, the one from Searchmetrics, and this one from motoricerca.info. Run all the URLs you are testing through the keyword density tool. Copy and paste all the one word, two word, and three word results into a tab on the spreadsheet. Sort them all so you get total word counts aligned by position as I have shown in the linked spreadsheet. Set up the formulas as I did in the demo spreadsheet (you can just use the demo spreadsheet). This may sound a bit tedious (and it is), but it has worked very well for us at STC. You can also use usability groups and a number of other methods to figure out what users are really looking for on your site. However, what this does is give us a look at what Google has chosen to rank the highest in its search results. 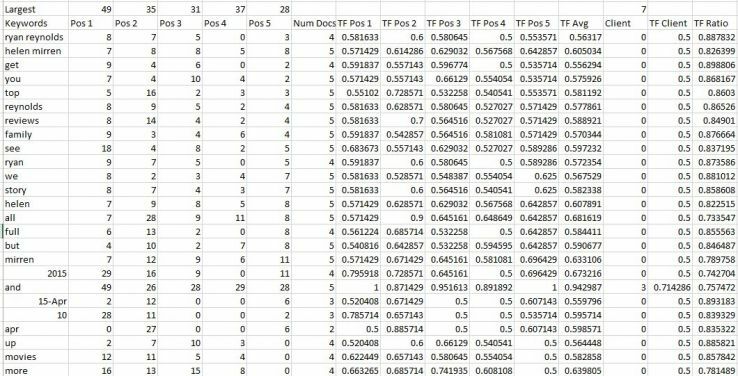 Don’t treat this as some sort of magic formula where you mechanically tweak the content to get better metrics in this analysis. Instead, use this as a method for slicing into your content to better see it the way a machine might see it. It can yield some surprising (and wonderful) insights! You can listen to it and download the slides here for free!) As a former print journalist who later became a digital marketer, I love to discuss this niche because I am very passionate about the topic. At the end of the Mozinar, the community had some intriguing and insightful questions (no surprise there! ), and Moz invited me to write a follow-up post to provide more answers and discuss the relationship between SEO and PR further. Before I address the questions and ideas at the end of the Mozinar, I just wanted to give some more credit where the credit is certainly due. People like me, who write for major publications or speak at large conferences, get a lot of attention. But, truth is, we are always helped immensely by so many of our talented colleagues behind the scenes. Since the beginning of my digital marketing career, I have known about SEO, but I have learned more about public relations from observing (albeit from a distance) The Cline Group’s front line PR team in Philadelphia over the years. Kim Cox, Gabrielle Dratch, Caitlin Driscoll, Max Marine, and Ariel Shore as well as our senior PR executives Bill Robinson and DeeDee Rudenstein and CEO Josh Cline. What I hope the Moz community learned from the Mozinar is what I have learned from them. Now, onto the three Mozinar Q&A questions that had been left unanswered. Why do you use Cision and not Vocus or Meltwater or others? RMP Media Analysis, LinkedIn, Alaniz Marketing and Ombud, then do further research into which platform may work best for them and their specific companies and needs. Do you have examples of good PR pitches? mobile-advertising network, a high-end vaporizer for the ingestion of medicinal herbs and a mobile app that helps to protect personal privacy. As you will see, these pitches incorporated the various tactics that I had detailed in the Mozinar. Important caveat: Do not fall into the trap of relying too much on templates. Every reporter and every outlet you pitch will be different. The ideas in these examples of pitches may help, but please do not use them verbatim. Are there other websites similar to HARO (Help a Reporter Out) that people can use to find reporters who are looking for stories? Are the other free, simpler tools? My Blog U, ProfNet, BuzzStream and My Local Reporter. Raven Tools also has a good-sized list. But I can only vouch for My Blog U because it’s the only one I have used personally. It’s also important to note that using a PR tool is not a magic bullet. You have to know how to use it in the context of the overall public relations process. Creating a media list is just one part of the puzzle. And now, the promised infographic! Thomas Kerr, who designs most of The Cline Group’s presentations and graphics while also being our social media and overall digital wizard. people and content (e.g., messaging, media relations, and materials, etc. ), while the “SEO” side focuses on things (e.g., online data, analytics, and research, etc.). See the end of this post for an important prediction. Second, I have put social media on the online side because that is where the practice seems to sit in most companies and agencies. However, social media is really just a set of PR and communications channels, so it will likely increasingly move to the “traditional marketing” side of things. Again, see the end. Third, there is a CMO / VP of Marketing / Project Leader (based on the structure of a company and whether the context is an agency or an in-house department) column between SEO and PR. This position should be a person with enough experience in both disciplines to mediate between the two as well as make judgment calls and final decisions in the case of conflicts. “SEO,” for example, may want to use certain keyword-based language in messaging in an attempt to rank highly for certain search terms. “PR” might want to use different terms that may resonate more with media outlets and the public. Someone will need to make a decision. The marketing work for each brand, product, or service will need its own specific goal and KPI(s) in step one. Separate audience research and persona development will need to be performed for each distinct audience in step two. So, for a larger company, such as the one described above, parts of steps 3-8 below will often need to be done, say, six times, once for each audience of each product. However, the complexity does not end there. Above is our modern version of traditional communications and marketing theory. 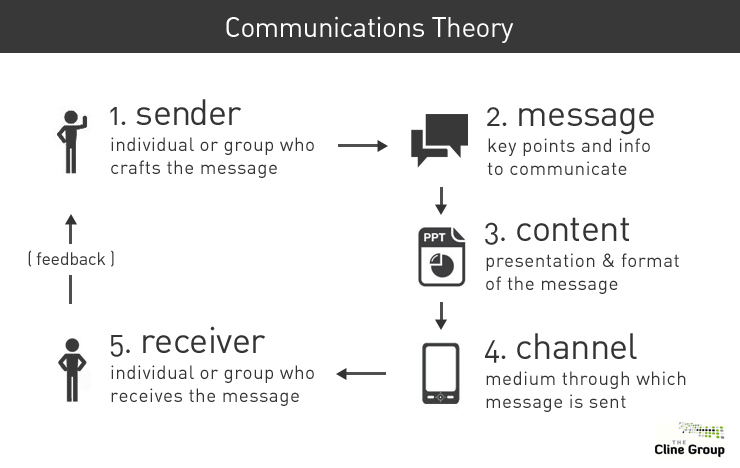 A sender decides upon a message; the message is packaged into a piece of content; the content is transmitted via a desired channel; and the channel delivers the content to the receiver. Marketing is essentially sending a message that is packaged into a piece of content to a receiver via a channel. The rest is just details. result of good marketing and not as a result of any direct linkbuilding. In the 2014 Linkbuilding Survey published on Moz, most of the (good) tactics that were described in the post – such as “content plus outreach” – are PR by another name. At SMX West 2014 (where I gave a talk on SEO and PR strategy), Rand Fishkin took to the main stage to discuss what the future holds for SEO. Starting at 6:30 in the video above, he argued that there will soon be a bias towards brands in organic search. (For an extensive discussion of this issue, I’ll refer you to Bryson Meunier’s essay at Search Engine Land.) I agree that it will soon become crucial to use PR, advertisingand publicity to build a brand, but that action is something the Don Drapers of the world had already known to do long before the Internet had ever existed. first and foremost aiming to help the readers)? The answer: Yes. people — not machines and algorithms. What the f&*# is a positioning statement? What is a pitch? I just wish “SEOs” had done this from the beginning. Of course, the same thing has been occurring in the inverse in the traditional marketing world. Traditional marketers have usually focused on these types of things: messaging documents, media lists, promotional campaigns, the 4 Ps, and SWOT analyses. Then, as more human activity moved to the Internet, they also woke up one day and saw an anarchic set of communications channels that operate under different sets of rules. Now, on the other end, I get the sense that traditional marketers are trying to learn as much as possible about SEO and digital marketing. 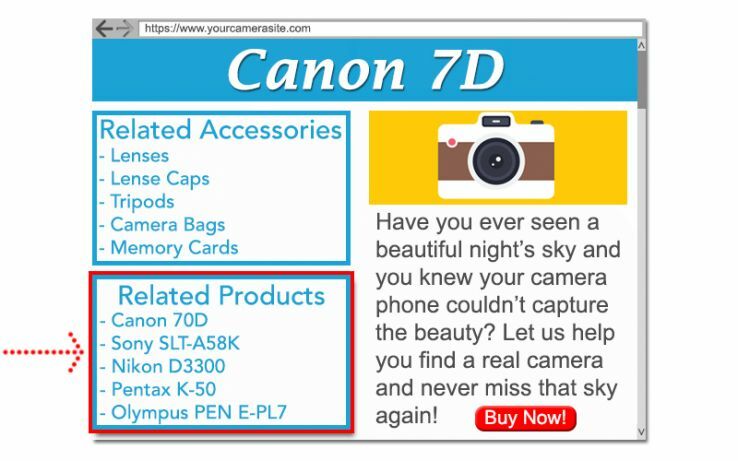 What the f&^% is a rel=canonical tag? What is Google+ authorship? I just wish traditional marketers had done this from the start. have written elsewhere, can also learn to use analytics as yet another way to gauge results. unto itself is quickly dying. The more SEO entails, the more the umbrella term becomes useless in any meaningful context. For this reason, it is crucial that digital marketers learn as much as possible about traditional marketing and PR. Want more? Don’t forget to watch the Mozinar — I’d love to get your feedback in the comments below!